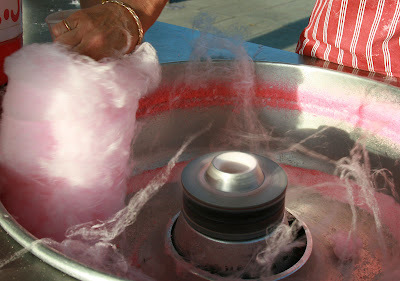 Summer just wouldn't be summer without candyfloss, cotton candy, spun sugar. What is it called where you come from? It's fairy floss in Australia. Also goose pimples are known as goose bumps. In Brazil, we call that Sweet Cotton - Algodão Doce! It's cotton candy in America. Speaking of which, I ate an entire bagful this past weekend! In France, it is called "barbe a papa" (dady's beard)! Nubes de algodón, in Spain, which is cotton clouds in English. Whatever it's called it's sticky, sweet, chewy & pink. Yum! It's cotton candy in english speaking Canada and barbe à papa in french speaking Canada. I've only ever had it once, but I always find that it looks like so much fun to eat, especially when I see how it's made like in this shot. Great capture! It's cotton candy here. We don't see if often but it is still a kids favorite when it's around. Zucchero filato is how we call it in Italy (should be "spun sugar", in English) . My husband loves it:Peter Pan's syndrome? In Germany it's called "Zuckerwatte" (sugarcotton), but I like the French "Barbe à papa" best! Lone Beader is right -- I'm amazed at all the imaginative names for that sugar fluff. As in English-speaking Canada, in the U.S. we call it cotton candy. You can find it at county fairs and usually at baseball games. Candy floss, when floss means a silk cocoon, or a bundle of threads. Candyfloss - yummy! I haven't had it for years. Great photo. First good pic I have ever seen of candyfloss making! yum! mmm definitely something of summer! I have eaten that maybe only 2 times in my life. Šećerna vata ("sugar cotton")... you can rarely find them here, and I can't figure out why. I used to love them when I was a kid.